This beef jerky recipe is made with a beef cut commonly used for London broil and marinated before drying in teriyaki, soy sauce, orange juice, and honey. Plan ahead because you will need to marinate overnight and the drying time can take eight to 12 hours. 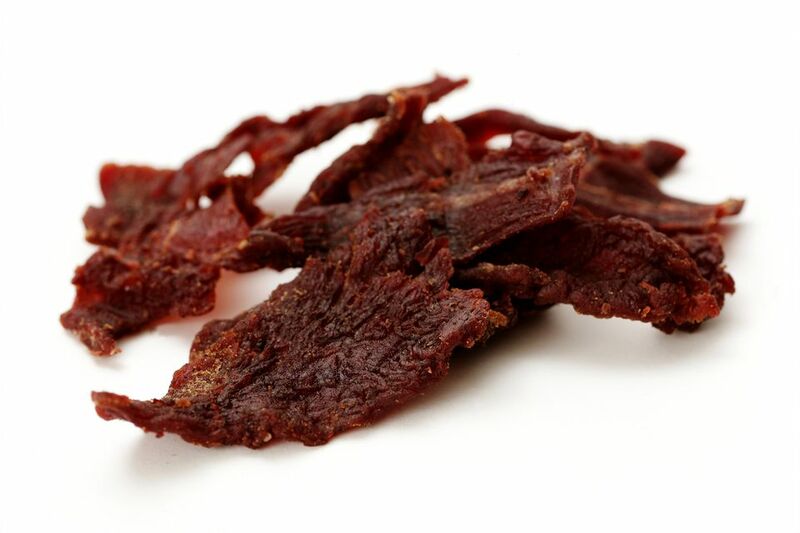 You can make this jerky in a standard oven or in a dehydrator. A typical jerky loses half of its starting weight in moisture, so one pound of London broil will yield 1/2 to 2/3 pound jerky. You can double this recipe if you have adequate drying space. In a medium-size nonreactive bowl, whisk together brown sugar, salt, onion powder, garlic powder, and pepper. Add teriyaki marinade, orange juice, water, honey, soy sauce, and liquid smoke. Whisk until salt has dissolved. Place London broil beef strips in a large freezer zip-top bag. Add marinade to the bag, seal, and toss to coat the meat. Unseal, squeeze out all the air, reseal, and refrigerate 24 to 36 hours. Pat strips dry with paper towels. Distribute beef strips in a single layer on dehydrator racks. Dry for 4 to 8 hours, turning racks every hour, and turning jerky strips over midway through the drying process. Drying times vary due to oven differences and meat size. When done, the jerky should have no signs of redness and be pliable enough to bend in half without breaking. Perfect jerky is firm and dry and not at all spongy. If your jerky is so dry it breaks in two easily, it's probably overdried.